In the next few weeks, my 2006 Pontiac Vibe gas mileage updates will be coming to an end. We are going to be getting rid of the Pontiac Vibe as our family needs a larger vehicle now. The Pontiac Vibe gas mileage tracker will remain online and I’ll make sure I update the information one last time. I’ve got a bunch of gas receipts that need to be entered. 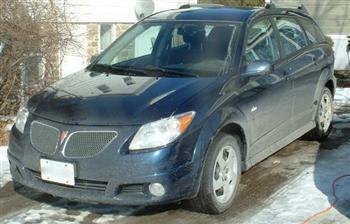 The Pontiac Vibe has been a fantastic car for us and we’re really sad to be giving it up. Unfortunately, it’s the car that is better for us to get rid of at the moment. We’re replacing it with a 2009 Dodge Grand Caravan (the deals are just too good right now!). I would have no problem recommending the Pontiac Vibe as a fantastic car for a couple or for a small family who has kids out of car seats. It’s also a great second car for commuting or piling everyone into for a short drive to the corner store or park. Our problem is we have two young kids in car seats and a stroller. Once you put the stroller in the back of the Vibe, you’re not going to be doing much shopping as there isn’t a whole lot of space left. With the two kids seats, the car is really a four seater. It’s impossible for us to go pickup anyone at the airport as a family. There just isn’t room for a person to sit in the middle between the two car seats. When we return the Vibe, it will have just shy of 96000km on it. We’ve had absolutely no issue with it. It even still has the original brake pads and rotors on it and they are in fantastic shape! It was 85-90% highway driven and maintained according to the recommended schedule. And hey, if you’re in the market for a used 2006 Pontiac Vibe and you know me, give me a shout and maybe we can work something out. :) I’ll even toss in the barely used winter tires on rims, the roof rack and the trunk carpet. This entry was posted in Automotive and tagged gas mileage, Pontiac Vibe, real world, save money on 2009/05/13 by Jeff Ivany.